One part of the secret sauce that enables PatternBuilders to provide more accessible and performant user experiences for both creators and consumers of streaming analytics models is its infrastructure. Our infrastructure makes it easy to combine rich search capabilities for a diverse set of standard analytics that can be used to create more complex streaming analytics models. This post will describe how we create those standard analytics that we call Measures. Feed An external source of data to be analyzed. These can include truly real-time feeds such as stock-tickers, the Twitter firehose, or batch feeds, such as CSV files converted to data streams. Event An external event within a Feed that analysis will be performed on. For example, a stock tick, RFID read, PBI performance event, tweet, etc. AnalyticsPBI can support analysis on any type of event as long as it has one or more named numeric fields and a date. An Event can have multiple Signals. Signal A single numeric data element within an Event, tagged with the metadata that accompanied the Event, plus any additional metadata (to use NSA parlance) applied by the FeedReader. For example, a stock tick would have Signals of Price and Volume among others. Tag A string representing a piece of metadata about an Event. Tags are combined to form Indexes for both Events and Measures. Captures an Event from a feed – stock ticker, RFID channel, the Twitter firehose, etc. Uses the Event itself and any appropriate external data to attach or enrich metadata and numeric data to the Event. Creates a MasterIndex from all of the metadata attached to the Event. This MasterIndex and the Date associated with this Event is used to create Measures and Models later on in the process. It can also attach geo data if appropriate. Extracts the numeric Signals for that Event. Pushes the Event object onto a named queue – the “EventToBeCalculatedQueue”–for processing. This queue, like all PatternBuilders queues, has a pluggable implementation. It can be in memory (cheaper, and faster) or persistent (more costly and slightly slower). One of the great advantages of the various cloud services, including our reference platform Azure, is the availability of scalable, fast, reliable, persistent queues. Measure A basic calculation that is generated automatically by the PatternBuilders calculation service and persisted. Measures are useful in and of themselves but they are also used to dynamically generate results for more complex streaming Analytic Models. Note that there is a MasterIndex field that is a concatenation of all the Tags about the tick. When the MasterIndex is persisted, it is actually stored in a more space efficient format but we will use the canonical form of the index as shown above throughout this post for clarity. To allow the user to easily find a Signal by searching for particular Tags. To act as the seed for creating indexes for Measures and Models. These indexes, along with a date range, are all that is required to find any analytic calculations in the system. A pure in-memory queue. This is ideal for customers that want the highest performance and the lowest cost and who are willing to redo calculations in the unlikely event of machine failure. To keep failure risk as low as possible, we actually replicate the queues on different machines and optionally, place those machines in different datacenters. Cloud-based queues. Currently, we use Azure ServiceBus Queues but there is no reason that we couldn’t also support other PaSS vendor’s queues as well. The nice thing about ServiceBus queues is that the latest update from Microsoft for Windows 2012 allows them to be used on-premise against Windows Server with the same code as for the cloud—giving our customers maximum deployment flexibility. AMPQ protocol. This allows our customers to host FeedReaders and Event queues completely on-premise while using our calculation engine. When combined with encrypted Tags, this allows our customers to keep their secrets “secret” and still enjoy the benefits of a real-time cloud analytics infrastructure. Once the Event is placed on the IndexRequestQueue, it will be picked up by the first available Indexing server which monitors that queue for new Events (all queues and Indexing servers can be scaled up or down dynamically). The indexing service is responsible for creating measure indexes from the Tags associated with the Event. This is the most performance critical part of loading data so forgive our skimpiness on implementation details but we are going to let our competition design this one for themselves :-). Let’s just say that conceptually the index service creates a text search searchable index for all non-alias tags and any associated geo data. Some tags are simply aliases for other Tags and do not need measures created for them. For example, the symbol AAPL is simply and alternative for Apple Computer, so creating an average volume metric for both APPL and Apple is pointless since they will always be the same. Being able to find that value by searching on APPL or Apple on the other hand is amazingly useful and is fully supported by the system. where n equals the number of non-alias tags and the upper limit for k is equal to n.
The indexing service can perform parallel index creation across multiples cores and/or machines if needed. 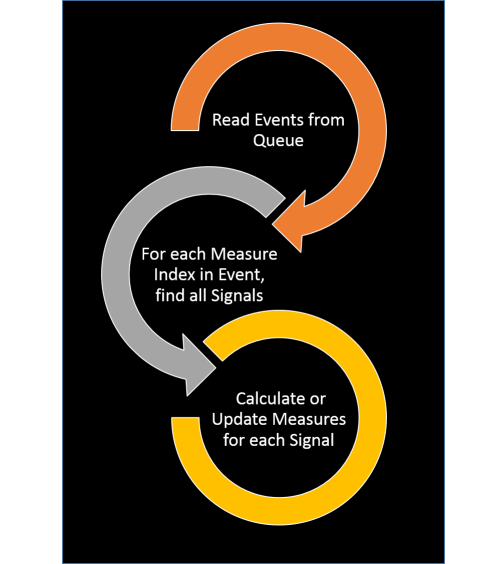 As Indexes are created, they, and each Signal in the Event, are combined into a calculation request object and placed in the MeasureCalculationRequestQueue queue that is monitored by the Measure Calculation Service. The analytics service will take each index and use it to create/update all of the standard measures (Sum, Count, Avg, Standard Deviation, Last, etc.) for each unique combination of index and the Measure’s native granularity for each Signal (Granularity management is complex and will be discussed in my next post). Attempt to retrieve the Measure from either cache or persistent storage. If not found, create the Measure for the appropriate Date and Signal. Perform the associated calculation and update the Measure. The advantages of this approach are manifold. First, it allows for very sophisticated search capabilities across Measures and Models. Second, it allows deep parallelization for Measure calculation. This parallelization allows us to scale the system by creating more Indexing Services and Calculation Services with no risk of contention and it is this scalability which allows us to provide near real-time, streaming updates for all Measures and most Models. Each Index, time, and measure combination is unique and can be calculated by separate threads or even separate machines. A measure can be aggregated up from its native granularity using a pyramid scheme if the user requests it (say by querying for an annual number from a measure whose Signal has a native granularity of a minute). A proprietary algorithm prevents double counting for the edge cases where Measures with different Indexes are calculated from the same Events. So now you’ve seen how we get from a raw stream to a Measure. And how, along the way, we’re able to enrich meta and numeric data to enable both richer search capabilities and easier computation of more complex analytics models. Later on, we explore how searches are performed and models are developed—you will see how this enrichment process makes exploring and creating complex analytics models much easier than the first generation of big data, business intelligence, or desktop analytics systems. However, before we get there we need to talk about how PatternBuilders handles dates and Granularity in more detail. At our core, we are optimized for time-series analytics and how we deal with time is a critical part of our infrastructure. This is why in my next post we will be doing a deep (ok medium deep) dive into how we handle pyramidal aggregation and the always slippery concepts of time and streaming data. Thanks for reading and as always comments are free and welcomed! Entry filed under: General Analytics, PatternBuilders Technology, Technology. Tags: analytic systems, big data, Microsoft, PatternBuilders Analytic Framework, Technology.